42% of the world’s leading companies see labour and skills shortages enmeshed with employee preferences as a key challenge to future operations, according to the latest annual European Occupier Survey by global real estate advisor, CBRE. The survey, now in its sixth year, polls real estate decision makers at 120 global corporations to understand their objectives and associated challenges across a broad range of issues. 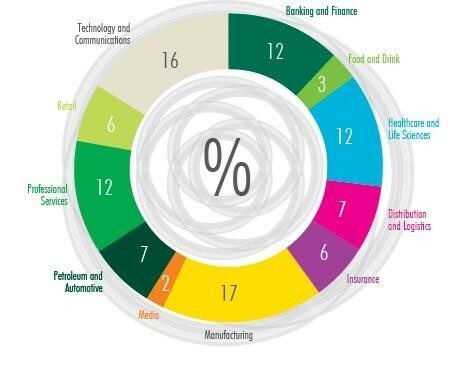 The respondents represent companies headquartered primarily in Western Europe or North America spanning multiple sectors, of which the largest are: manufacturing, banking and finance, professional services and, healthcare and life sciences. “A significant overhead, and in many cases the largest, for a company is the cost of its people. Increasingly companies want to maximise the return on human capital by providing workspaces that promote choice, collaboration and high levels of employee satisfaction, to attract the best staff and to support their brand. Likewise, employees want a voice – whether that’s the location of work, flexible working or a say in the office layout. This means there is ongoing recognition that the workplace must provide a high quality experience to entice and retain staff. Underpinning the workplace agenda is the increasing focus on performance – both people and property – to drive better business outcomes. Central to this is the importance of data: 75% of companies now regard better, and more accurate, data as the single most important factor in supporting corporate real estate strategy and identifying new opportunities. Despite concerns surrounding the macroeconomic environment - 58% cite economic uncertainty as a key challenge – anxieties about cost management have diminished in the last year. 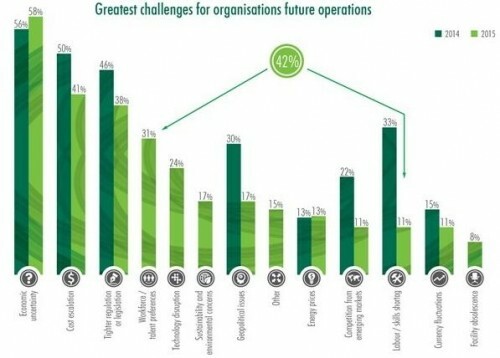 41% of companies, down from half (50%) in 2014, see this as one of their main business challenges. “In recent years we’ve seen some substantial shifts regarding corporate real estate (CRE) strategy drivers. Companies have lived through the recession and, at varying speeds, recovery. For a while cost management dominated, and then as conditions eased workforce issues and growth came to the fore.